3 simple steps will guide you! 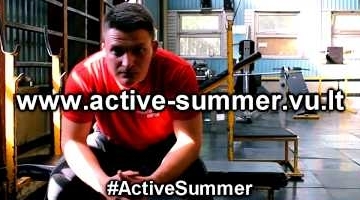 Engage in an active Summer and accept the University Summer Challenge! Vilnius University has invited 11 universities into a fun competition with oneself, one's colleagues and other teams, all in all striving together for a better and healthier lifestyle! Register a minute of your physical activity today, help your team score and enjoy your Summer! Accept the „University Summer Challenge 2018“! Are you a member of Šiauliai University's community? Do you want to take part in international Project "University Summer Challenge 2018"? On the 28th-30th of May you are invited to try Health Laboratory with free of charge evaluation of your body's functional status and physical capacity. On the 1st of June - 31st of August Vilnius University Health and Sport Centre invites academic community – students, lecturers, professors, scientists, administration and other employees – to accept the challenge and try yourself in international, interdisciplinary project „University Summer Challenge 2018“. On the 28th of May Health, Physiotherapy and Sports Center of Šiauliai University started preparation for University Summer Challenge and invited its community to evaluate their bodies and its physical abilities in the Health Laboratory. On the 23rd of May Vilnius University Health and Sport Centre invited VU community to evaluate their bodies and its physical abilities before the University Summer Challenge begins. Some pics from the Health Laboratory! Take a look at the universities charts by percentage! Read the stories of other teams! Get to know the stories of other participants! Check out the recommended links! Vilnius University Health and Sport Centre invites you to take care of your health - whether it is physical, psychological or social well-being! We invite all students, employees and guests to enjoy interdisciplinary events, academic courses, sports for pleasure, professional trainings and individual trainings in the premises of Vilnius University and to engage in an online interuniversity active summer challenge for universities over the world!